We have all been there, whether it’s looking for partners, potential clients or investors; spending far too much time mining the internet for key information and contacts. As you probably already know time is money and this time should be spent engaging with prospects rather than searching for them. The Biotechgate database enables you to quickly search for and identify key information in a few clicks of a button all in one place and saving you valuable time. In addition you can download all of your results in to excel which includes key contact details. 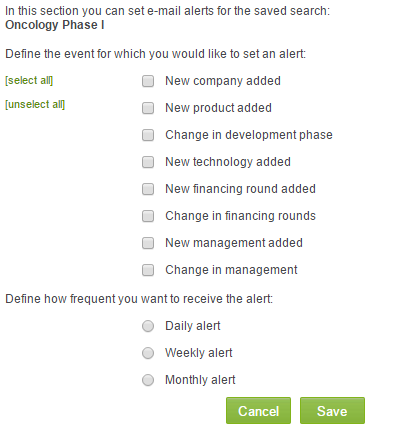 Biotechgate also provides a save search/alert feature which means you only have to carry out one time searches and receive alerts when new and updated information is added to your particular criteria. You can even define at what event you want to receive an email alert (e.g. new product or change in development phase) and how frequent they should be sent to you (daily, weekly or monthly). Thanks to these tools you get the ability to quickly identify and download your required data so that you and your team can spend less time searching and more time engaging. 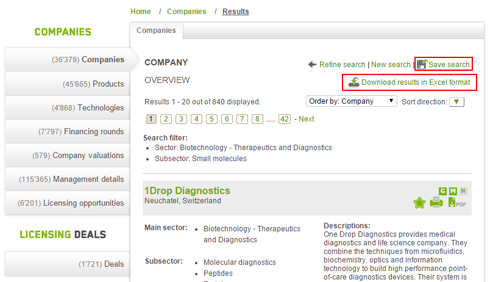 How will you know that the development phase of a Biotech product has changed?